Phil gave this speech at 2nd Grade Parents Night this spring. Hi, my name is Phil Holt, and I am here to talk to you about choir. I am an eighth grader who started choir in the third grade. Choir is a beloved activity for me, so I hope I can broaden your understanding of choir. I auditioned for Choir because I liked to sing. 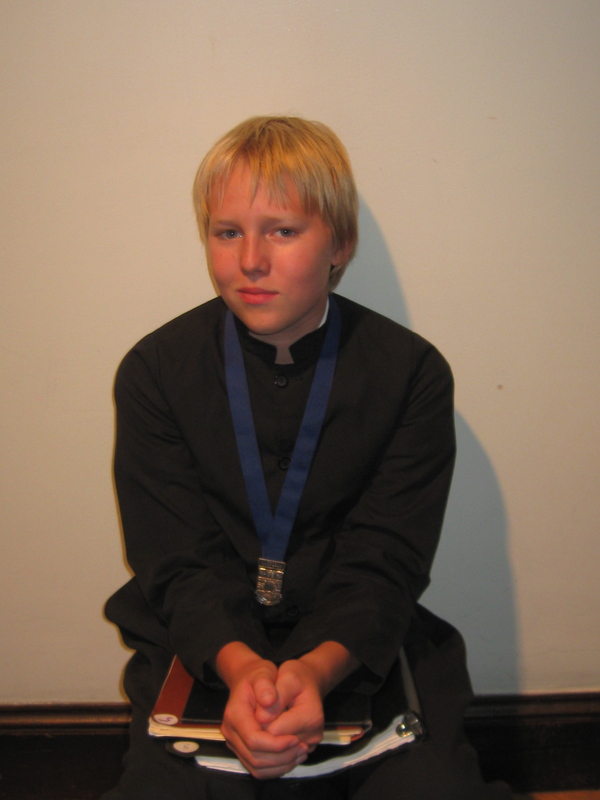 I was accepted, and began attending the weekly rehearsals for novice choristers. The first-year commitment is very minor. 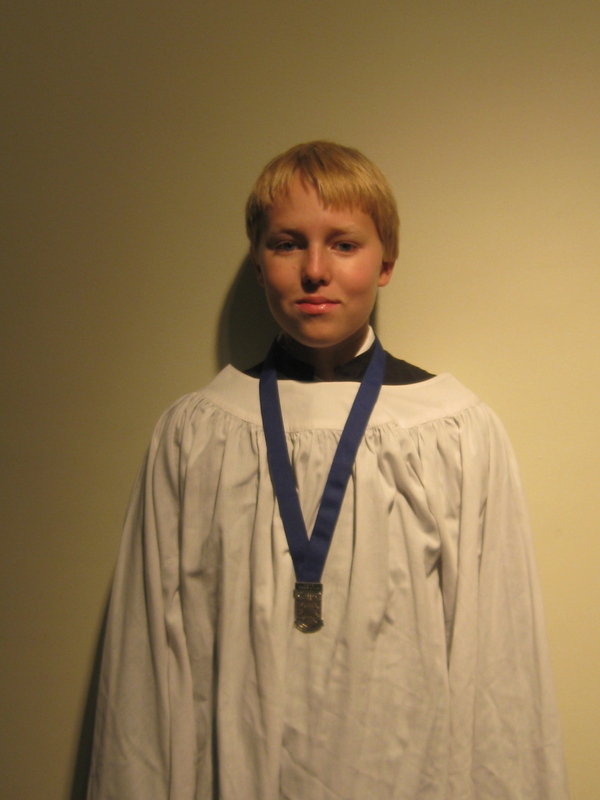 The novice choristers have very few Sunday services where they are required to be there, and one rehearsal per week. I enjoyed learning the repertoire, vocal techniques, and musical theory taught to me during these sessions. I began taking piano lessons a year after I started Choir. The musical education I received from Dr. Allen was so thorough, I was able to read music and identify intervals before I started piano, which gave me an advantage when studying the instrument. I think the novice year is not only to teach the choristers to sing and read music, but also to gauge their interest in choir. The commitment steps up considerably at the senior level, which is what fifth through eighth graders are. Dr. Allen likens the commitment to that of a Varsity sport. We are required to attend rehearsals at 7 a.m., and sing at every other Sunday service. However, despite the ironically ungodly hour, I love the rehearsals because of the friendships made during the breakfast club beforehand. Dr. Allen recognises that choir is in a sense a job, and pays us with a modest stipend. That is not why anyone sings in the choir, but it is very inspiring to receive a paycheck twice a year. We sing very sophisticated music, which range sfrom the twelfth century to modern day compositions. The songs, which include anthems, hymns, and psalms, are for Soprano, Alto, Tenor, and Bass singers. The boys and girls sing Soprano, while professional adult singers sing Alto tenor and bass. The music is very fun to sing, and the repertoire increases in difficulty and enjoyment as we improve. Choir also provides amazing concert opportunities. For example, I sang at Carnegie hall when I was in fourth grade with three other choirs and a symphony orchestra. I also sang a concert tour in Italy two years ago, in which we travelled to Assisi, Trevi, and Rome and sang at St. Peter’s Basilica in the Vatican, St. Ignacio’s Basilica, and Saint Francis Assisi. This summer, the choir is taking a trip to Vienna, Prague, and Salzburg. We are singing at the church where Mozart worked, as well as other famous cites. On these two-week trips, we tour cities, landmarks, and cites in addition to singing in the concerts. And they are definitely as amazing and fun as they sound. Reasons people often decide not to join choir include not being very religious, or having a weekend home. One does not have to be a Christian to be in Choir. Buddhists, Jews, and Hindus populate the choir stalls. Often, the parents are not active church goers, but go to church to hear the beautiful music their child produces. Also, about one-quarter of choristers have weekend homes, but still manage to attend the Sunday services. Recently, I became one of these people. We either leave Sunday morning, or Saturday night, which is a sufficient amount of time to escape the city. If you are still unsure if you would like to have your child join choir, please attend choir appreciation Sunday on June Tenth. Even if you are sure you want your kid to join choir, still come June tenth. This is the grand finale of all Sunday services, which features the most thrilling music and a delicious barbecue and raffle after in the play yard, and a chance to meet Dr. Allen, who is the nicest person in the world, and incredible teacher. and I believe we have time for any questions you may have…..